In a galaxy filled with novelties like sentient trains who travel at faster-than-light speeds on specially crafted rails through K-gates stationed on nearly a thousand worlds and moons, Zen Starling is a light-fingered teen who lives with his mother and older sister Myka; their mother suffers from paranoid delusions, and every time her fears of persecution become too much for her to bear, the trio packs up their few belongings and settles on a new world. Zen catches the attention of Raven, a man with an axe to grind against the Network Empire, a family-run corporation which controls the galaxy, as well as the mysterious Guardians who oversee the operations of the K-gates and the K-bahn which connects the gates. Raven hires Zen to steal a small box, a “Pyxis,” from Emperor Mahalaxmi XXIII’s art collection on his special train, with the assistance of Nova, Raven’s hand-built and very unique A.I. Once Zen retrieves the Pyxis and hands it over to Raven, he will be paid handsomely enough that his family will never have to live in squalor again. Luckily, Zen is smart enough to think this all sounds too good to be true. Reeve fills Railhead’s pages with unexpected, imaginative details. Locations are unique: from the Ambersai Bazar, a multi-cultural melting pot infused with chai, chapatti, and bhangra; to the pristine sands and abandoned hotels of Desdemor, a lone island on the watery moon Tristesse; to the city of Cleave’s neon-lit slums, every place is as fully-realized and distinct as the personalities of the people who live there and the trains which connect them. The Thought Fox, for example, is an angry entity which takes and expresses joy in destruction; the Damask Rose, however, is snooty and prim despite its faded glory. Artists love tagging trains with graffiti, and some trains wear exceptional tags with pride, refusing to let their maintenance spiders scrub it away. Humans aren’t the only creatures who want to ride the rails: Hive Monks, a collective of millions of insects which approximate human shape and speech, share legends of long-lost rail lines. There are even wealthy people who breed Old Earth megafauna and dinosaurs for their own amusement! Reeve was clearly invested in creating a living, fresh universe which would entertain the reader. I also enjoyed the blending of old and new technology. The trains are made up of massive locomotives which pull railcars, but are powered by advanced technology and are capable of traveling through the vastness of space. 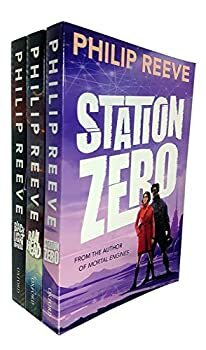 The notion of classically-styled locomotives and passenger cars fitting cheek-by-jowl with virtual reality headsets and space-folding gates charmed me, and Reeve made it all feel very plausible. Nova is a Motorik, a “wire dolly” android, who enjoys watching Humphrey Bogart movies and self-adjusts her skin pigmentation in order to make herself feel more human. Most Motorik are content with lives of service, but Nova was built with grander aspirations. Other characters like Flex, a graffiti artist living in Cleave, or Threnody Noon, who meets Zen at the outset of his caper, enrich and round out the story; both are irreversibly changed by their interactions with Zen, who is, himself, sorely tested by Raven’s machinations. Railhead is also filled with subtle Easter eggs which are sure to please fans of Frank Herbert, Arthur C. Clarke, the Star Trek television series, and possibly even the Mass Effect video game trilogy. These references will absolutely reward readers who recognize them while encouraging unfamiliar readers to seek out media beyond the text. The primary influence is Herbert’s DUNE mythos, but Reeve puts enough of himself into his novel that it never felt derivative, and readers who haven’t yet experienced Dune will not feel left out. In short, Railhead was a lot of fun, and I’m pleased to have spent a few afternoons immersing myself in Philip Reeve’s fiction. He has a gift for blending old and new ideas into his own individual creations, resulting in a novel which was entertaining and completely satisfying. Highly recommended. Speculative fiction loves trains, from the Hogwarts Express to Snowpiercer to The Polar Express to the serene and strange train journey featured in Hayao Miyazaki’s Spirited Away. There’s just something about steam engines that conjures up a specific type of luxury, intrigue, charm and mystique. Philip Reeve obviously feels that allure, though in Railhead he gives locomotives a science-fiction spin. Set in the far distant future, the Great Network is an interstellar railway that connects hundreds of planets, each populated by humans and androids, drones and engineers, Hive Monks and the mysterious Station Angels. People travel the Great Network through K-Gates from one planet to another, finding work and enjoying the sights. Zen Starling is one such “railhead”, using the Network not only to earn money but for the sheer pleasure of travelling. Of course, his line of work involves pick-pocketing and shop-lifting, so the trains just as often provide escape as they do sight-seeing opportunities. Then one day Zen is approached by a woman with a red umbrella who makes him an offer. Her employer wants Zen to steal something from a train owned by one of the powerful Corporate Families, promising him enough money to care for his mother and sister for years to come. The Noon family train is owned by Emperor Mahalaxmi III, and it so happens that Zen (for reasons I won’t divulge) is perfectly suited to impersonate one of his imperial relatives, allowing him to get on board and steal a particular artefact from the train’s private museum. Philip Reeve has a real gift for world-building, with descriptive prose that flows as smoothly as water. I was completely enraptured by his post-apocalyptic vision in THE HUNGRY CITIES books, and though Railhead has a slightly more whimsical outlook (though it’s not without death and darkness) he has the ability to depict a far-distant future where sentient trains carry people through the stars and NOT make it sound ridiculous. Zen is an engaging protagonist, rather like Aladdin in his cheerful amorality, though he eventually comes to takes responsibility for the consequences of his actions. There’s also a strong supporting cast, particularly the enigmatic Raven, who covets the mysterious box that he hires Zen to steal for reasons that only become clear in the latter half of the book. There is some interesting commentary on the difference between the haves and the have-nots, and plenty of immersive details such as Threedies, Motoriks and the Datasea, all added to create a rich and detailed universe. Perhaps most fascinating is the inclusion of Guardians: godlike artificial intelligences that originated on Old Earth and who created the Great Network for the human population. They’ve long since departed from the corporeal plain, but occasionally they download themselves into genetically modified vessels in order to interact with people – and Zen’s activities have caught their attention. As good as it is, Railhead isn’t Reeve’s best work (some of his romances fall rather flat) but it was still everything I’ve come to expect from him: complex characters, fluid prose, twisty plots and fascinating world-building. There’s so much inventiveness on display that it’s difficult to summarize it all, but the book’s real value lies in the humanity of its characters (especially the ones that AREN’T human) and the journeys they take together. I was a huge fan of Philip Reeve’s MORTAL ENGINES series, and Railhead, the first book of a duology, finds him in equally good form, offering up a fast-paced story filled with tension and wonder that, I’m happy to say, loses no steam in its sequel, Black Light Express. The central conceit is that in a universe where humanity has colonized the stars, travel between planets is not by spaceship but by AI trains (with independent thoughts and feelings) that travel through hyperspace gates. Humans are ostensibly governed by an Emperor, which over the millennia has been the head of one of the corporate families that controls the main lines. But in reality, the true overseers are the Guardians, super-AIs developed on long-ago Earth who have become like gods with a mission to guide and protect the human species. Other setting aspects include Motoriks (robots) and Hive Monks (insects that are mindless as individuals but which are intelligent in large numbers). The main character is a young thief named Zen Starling, who after getting recruited for a heist job by Raven, the Guardian’s Most-Wanted fugitive, and Raven’s upgraded Motorik Nova, ends up pulled into an intrigue that will threaten to topple empires and lay bare long-hidden secrets about the Guardians, the trains, and the gates. Also entangled are the Emperor’s daughter Threnody, and Malik — the dogged Railforce agent who has been chasing (and killing) Raven for years. And one can’t forget the trains themselves, which thanks to their AI nature become secondary characters in their own right. The plot is propulsive, beginning with a bang and sweeping the reader along for the ride from then on, only slowing now and then to allow for a few (really, just a few) introspective moments or for some momentarily quiet times between characters to allow relationships to develop just a bit more before someone else gets chased, shot at, nearly blown up, kidnapped, and so forth. There are also several moving moments sprinkled in amongst the chaos. The worldbuilding isn’t encyclopedic, but Reeve, as he did with the MORTAL ENGINES books, is able to not only convey the important setting points quickly and efficiently, but also manages to slide in some wonderfully vivid details, as when a train slides from one station to another and the reader is treated to a wonderfully tantalizing glimpse of a strange planet. One therefore has both a sufficient understanding of this invented universe and a few startling images to hang the whole thing on without the world-creation bogging down the story. As a character, Zen is stubbornly, and perhaps surprisingly (given the YA nature of the story), consistent in his “looking out for number one” attitude, which adds a bitter tang of realism to the tale, as far too often “tough” characters end up all-too-quickly with the heart-of-gold reveal or transformation. This can be discomfiting at times, especially as Reeve isn’t shy about ratcheting up the body count, and while Zen isn’t wholly blasé about the deaths around him, he’s also less forthrightly moved/motivated than is usual for the typical YA character. Nova is a bit more traditional, a combination of the humanoid robot that wants to be (and maybe is) a “real” girl character and the spunky, determined young girl character. Her depth comes from the conflict she feels between her feelings for Zen and her loyalty to Raven, her creator. Malik, as well, is a familiar type — the tenacious cop whose single-mindedness gets him in trouble with the superiors (but who is almost always right), but is individualized by some nice details/back story and by his stylistic voice. 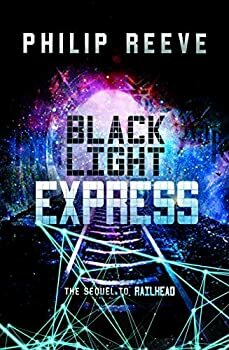 A few other characters, as well as some storylines, get short shrift in Railhead and may even seem as if they’ve been abruptly dropped, but many (characters and story lines both) play an important role or gain depth in Black Light Express. The action, as noted, steams right along, beginning as a caper story but then becoming an admixture of a heist tale, a political thriller, and even a mystery (where did the Gates come from, what’s going on with the Guardians, how has Raven been killed so many times?) Most of the answers, when there are any, come at the end, but as is often the case in a first book, they either present more questions or are only partial answers, so readers will want to have the sequel nearby to continue the story. Otherwise they risk feeling a bit let down. Published on April 1, 2016. The Great Network is an ancient web of routes and gates, where sentient trains can take you anywhere in the galaxy in the blink of an eye. Zen Starling is a nobody. A petty thief from the filthy streets of Thunder City who aimlessly rides the rails of the Network. So when the mysterious stranger Raven offers Zen a chance to escape the squalor of the city and live the rest of his days in luxury, Zen cant believe his luck. All he has to do is steal one small box from the Emperors train with the help of Nova, an android girl. But the Great Network is a hazardous mess of twists and turns, and that little box just might bring everything in this galaxy and the next to the end of the line. The highly anticipated novel from Carnegie-medal-winning author Philip Reeve, Railhead is a fast, immersive, and heart-pounding ride perfect for any sci-fi fan. Step aboard the universe is waiting. I just love these names! This sounds like a beautiful, immersive read. Thanks, Jana! Excellent review, Rebecca! I’m glad to know you enjoyed this one.